PRODUCT DESCRIPTION: Solar powered "vibrating" and audible sound producing repeller used to chase away animals like moles, gophers, voles, chipmunks and other ground dwelling pests. The sound is released on a regular basis making the local area a place where nuisance animals won't feel comfortable. Each unit is made with strong plastic so they're weatherproof and will last for many years. Using the power of the sun, the small solar panel on top will collect light during the day to keep its on board battery fully charged. Units will work right out of the box but we suggest you let them sit in the sun for 1-2 days prior to installation. This will allow them to fully charge and have more of an impact immediately. There is a small on/off button used to activate the unit. Once turned on, it will release a sound every 30 seconds. The sound and vibrating waves will only release for about 2 seconds. By itself, this sound is not overwhelming to animals and you will have to be within a few feet to hear it once units are in the ground. But they are relentless and ultimately the constant noise heard over and over will drive ground nesting animals off your property. WHERE TO USE IT: In the ground where nesting nuisance animals are active and not wanted. When trying to repel active nesting animals, its suggested you place units in the middle of their nest dens and let the unit work for at least one week before deploying units along property borders. This will allow nesting animals an escape route and not keep them "trapped" on your land in between two units. HOW TO INSTALL: Units need to be inserted in the ground deep enough to bury all but 1-2" of the stake. This will keep the head unit off the ground and away from water. 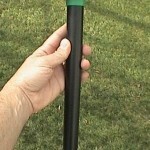 To properly install units, its advised you first use a SOIL AUGER to drill holes in the ground. DO NOT ATTEMPT TO PUSH THE REPELLER INTO THE GROUND! These units are strong but not designed to handle extreme downward force and can crack. 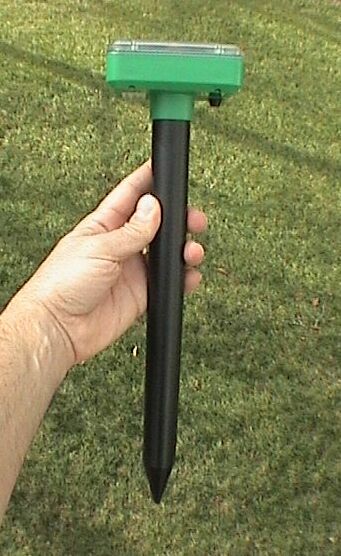 To properly install them in the yard, first make holes and then insert units making sure the controller top is 1-2" above ground when the stake reaches the hole bottom. RATE OF APPLICATION: Each device should cover up to 6,500 sq/ft (approximately 1/6 acre) but this will depend largely on the soil type where they reside. Soft loamy, sandy soil won't transmit the sound waves as well compared to hard pan or clay. Obstructions like cement driveways and walkways will also take away from the effective coverage area and should be noted. ** WHEN USING UNITS ON ESTABLISHED GOPHER OR PRAIRIE DOG DENS, ONLY DEPLOY UNITS WHERE ANIMALS ARE ACTIVE. THIS WILL GIVE THEM TIME TO LEAVE THE AREA AND NOT BE TRAPPED BY UNITS AT YOUR LANDS BORDER. ONCE ACTIVE ANIMALS ARE GONE, SET UNITS ALONG PROPERTY LINES WHERE THEY MIGHT ENTER.